This friday, the Amazon Treasure Truck celebrated its first year anniversary, see the offical social media updates on Facebook and on Twitter. You will be part of building an innovative new retail experience focused on creating new daily habits, cross shopping, and brand loyalty through physical vehicles. The Senior Business Development Manager will help to shape and drive the new offering by delivering unique and amazing product offers for our customers. 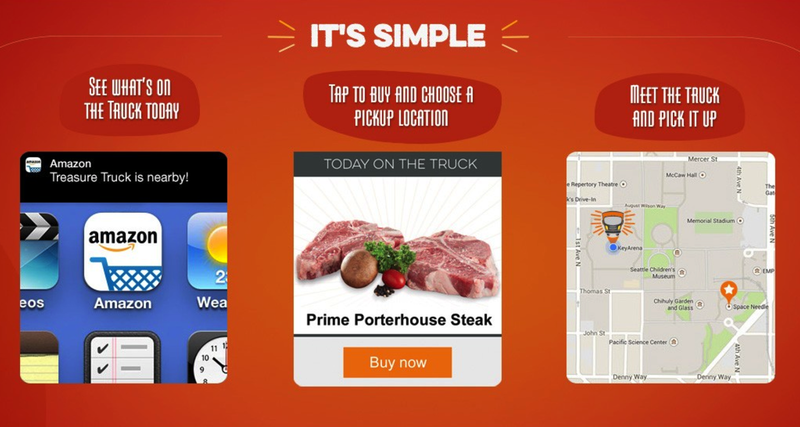 Download the latest version of the Amazon Mobile Shopping app, and select Treasure Truck from the main menu. After you tap the I Want This button, you’ll choose the Treasure Truck location and pickup window that is most convenient for you. Then, come meet Treasure Truck at that location, anytime within the pickup window, on the very same day you order. Our featured products can only be purchased using the Amazon Mobile Shopping app on iPhone, Android, and Fire Phone. For the best experience, make sure you download the latest version of the Amazon Mobile Shopping app from the app store. You cannot place an order over the phone or the PC website, and we do not ship Treasure Truck products—to get your purchase, you come meet the Truck! Household created the brand expression and experience for the Treasure Truck, developing the proposition, logo and assets, packaging, analogue and digital communications and interactive truck experiences. We also repurposed the truck chassis itself, partnering with CSG in Detroit to build and manufacture the truck. As is the case with so many parts at Amazon these days, the Treasure Truck is designed to be a marketplace and service for brands, manufacturers and local partners. And the potential here lies in part in building a system that is parts last mile logistics service, part pick-up location, fueled by mobile. The Treasure Truck might, over time, morph into a full-fledged local & mobile marketplace. Mobile is not just apps.